This document has information about Azure deployment and hosting problems that you may experience, with suggested solutions. If your problem-and-solution is not covered in this document, contact me with details, and I can add it. Scenario: Deploy an app to Azure. It attempts to load in a browser, but shows a “Runtime Error”. Click to open full-size in its own tab/window. Explanation: There is a serious error in the app. We will not be able to access any of the app’s resources. Try this: Follow the instructions shown on the page. Scenario: Deploy a web service to Azure, which includes the Web API Help Page feature. The app will not load in a browser, and shows a “Could not find…” error. Explanation: Read the error message page. I do not know the cause with certainty. I see this error occasionally, but have not yet determined a pattern. Try this: Force the “publish” process to send the file. How? 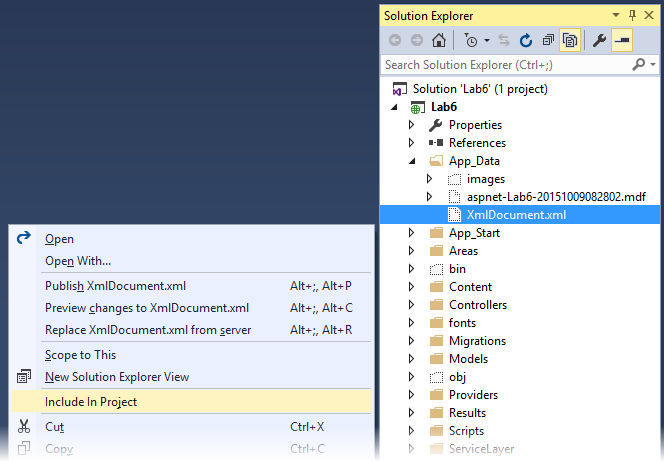 In Solution Explorer, show all files. In the App_Data folder, right-click the XmlDocument.xml item. Next, right-click the item, and show its properties. Publish again. That should fix the problem.